We are facing a real Global Meltdown that is brewing beyond. Greece was the tip of the iceberg. Governments are imploding. Japan is doubling its sales tax and its national debt will exceed $12 trillion dollar next year – not far behind the USA. Spain is in really dire financial position. Capital is pouring out of the country. More than 25% of GDP in wealth has taken flight. Once Spain goes, there goes the EU. The Spanish banking system is on the verge of systemic complete failure. So much capital has been fleeing Spain the ECB is now pouring in on average, more than €300 billion on a monthly basis to meet liquidity needs. Since the total Spanish banking system is about €3 trillion in size, the financial crisis brewing is amounting to almost 10% of total banking assets on a monthly basis. This is simply unsustainable. Governments worldwide are in crisis. There is a great disparity between the state and local governments who cannot manufacture money at will and the sovereign national governments who can. If you think for one moment that sovereign government bonds are the flight to safety, you better stop smoking the weed. In the United States, you will see further rises in social security taxes because this is of course not a tax but a garnishment on income that goes into the same spending pot. Therefore, the so called “poor” who the Democrats swear they will ease their burden by getting those rich bastards once and for all, pay attention to Social Security. Since that is a garnishment and not a tax on income, it is not refundable and it skirts the whole rich v poor nonsense – everyone pays. Local governments have figured this out as well. The City of Philadelphia has chased out the “rich” and those left behind and brain-dead and just like throwing their money down the drain. Property taxes are rising because once again this is free of income. Regardless what you have in income, you owe taxes on the property you have even if you do not have a job. The city of Scranton, Pennsylvania reduced all government wages to minimum wage. In Spain, Catalonia, Spain’s most indebted region, announced it could no longer pay subsides in July to hospitals, old age homes and other social services. In South America, Argentina is also in economic decline thanks to debt and there too we see local governments imploding. Normally, the provincial cities receive funding from the provincial governments. However, this has dried up in some areas shoving cities into cash-strapped debtors who cannot pay their bills or even their own employees. They have turned to trying a raffle to determine which civil servants will receive their pay first. Employees will queue up to get paid and when the money runs out, those in the end of the line are out of luck. The first draw for the raffle took place on Friday, July 20th. Only 23 of the town’s 92 employees received their pay. The mainstream press is simply not covering these issues. Federal governments continue to suppress free elections and free speech. In Spain, watch this one closely. Right now 6 out of 17 Spanish regional provinces are is serious budgetary crises. Since the federal Spanish government is itself is bankruptcy, there will be no white knight on the horizon. Capital is fleeing everywhere, as it rightly should. Governments are in hot pursuit determined to destroy Western Civilization as if they confiscate every dime from the private sector this will somehow miraculously save the world. Capital outflows from Spain have been more than €41.3 billion ($50.7 billion) in May, quadrupled to the outflow one year ago according to figures released by the Spanish central bank. For the first five months of 2012, a total capital outflow has been about €163. This massive capital outflow is the same pattern we saw when our computer forecast the collapse of Russia that created the Long-Term Capital Management debacle in September 1998. This capital outflow is stripping banks of deposits and was the reason behind the banking conglomerate, Bankia, having requested a bailout in May. The Spanish government ‘s response has been to try to punish capital leaving. They have imposed fines and criminal punishment as always since no0 government respect human rights when it comes to their pocket-book. The new restrictions imposed by Spain on capital are fine of €10,000 for taxpayers who do not report their foreign accounts; fines of €5,000 for each additional account; there can be no cash transactions greater than €2,500; and these restrictions apply to businesses as well as individuals. In other words, Spain is so desperate for money, they will destroy business with such restrictions. Governments are out of control. This is the worst possible outcome we face globally. The United States has lowered the $10,000 reporting on the movement of cash to $3,000. They are going to cause a worldwide economic implosion of untold proportion. They are now trying to criminalize natural human behavior of protection ones self-interest from basically thugs. This is like saying the police can beat your wife or child and if you dare try to defend them, you go to jail for obstruction of justice. You cannot confiscate the wealth of any individual because you are fiscally irresponsible. This is like a landlord renting you an apartment and saying that at any time he can raise the rent if he spent too much money having a good time. The individual is always screwed. In Iceland, mortgages are adjusted according to the currency fluctuations. If you borrow 1 million Icelandic króna and the currency declines by 50%, you now owe 2 million. Because the banks were brain-dead in their investments, now they have put that burden on the homeowner. People now owe more than what they paid for the house. Wages do not fluctuate in such a manner. The Spanish “bailout” of €100 billion is a joke. This amount is nothing compared to what Spanish banks are drawing from the ECB at this time. Where the money is supposed to come from and how is this going to reverse the worldwide debt implosion? Spain asked Germany, for an additional €300 billion. Germany is being dragged down the rabbit hole for the Debt to GDP ratio is up to 90% thanks to all these EU bailouts. In reality, Moody’s has put the Germany on a negative watch and it could lose its AAA credit rating as was the case with France last year. The IMF is simply dead in the water. The Sovereign Debt Crisis is brewing. We will present the only possible solution at the San Diego Conference along with how to shelter your net worth and survive what could become the fall of Western Society because governments everywhere simply refuse to live within their means and stop this crazy borrowing with no intention of ever paying anything back. 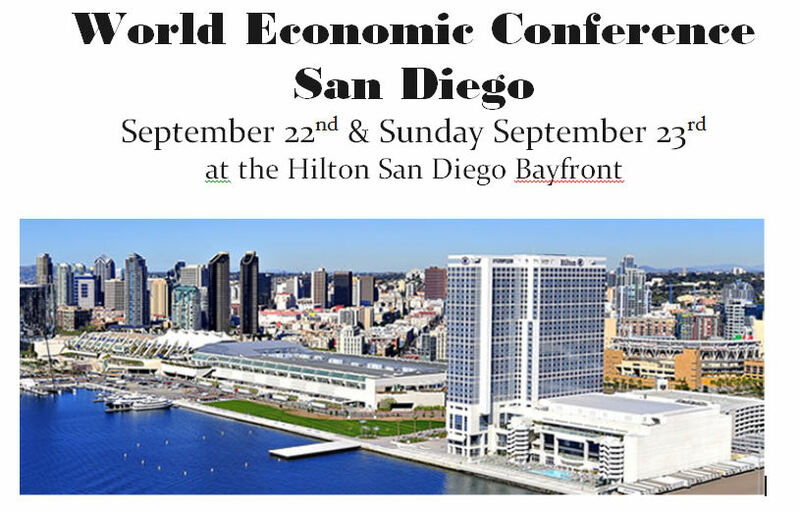 This Conference will be held on Saturday September 22nd & Sunday September 23rd at the Hilton San Diego Bayfront to host this event. The hotel is located on the bay with “city views” and is in walking distance to the “Gaslamp quarter” and PETCO park. You can view more information about the hotel, including room rates and a photo gallery at-http://www.hiltonsandiegobayfront.com/. We at Armstrong Economics are very excited to host our 2012 U.S. event at this stunning venue. Because the economy is becoming so dangerous on a global scale and we are on the verge of a real economic implosion, we will offer the summary session on Sunday at $750 and the two day Event at $1500. 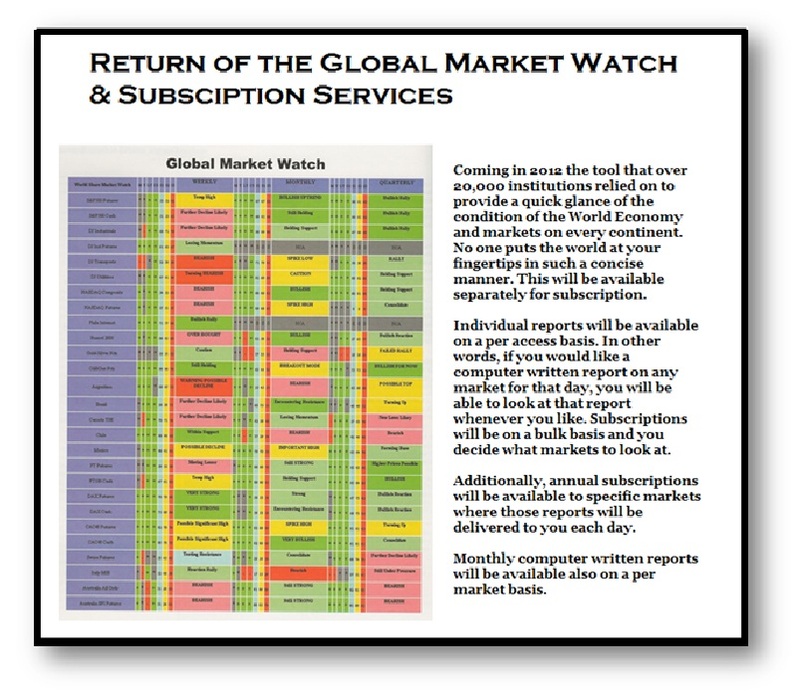 The full service event with the 6 month subscription to the Global Capital Market Watch, which will be necessary to monitor the world economy at a glance, will be available for $2,000. This will be exclusively a forecasting conference. We will be going over all the major world share markets, metals, agricultural, bonds, and currencies of North America, Europe, Asia, Australia-NewZealand. We are trying to make this available to the average investor who is forced to make the same decision a hedge fund manager does because of regulation that blocks global management availability for the average person. The summary section on Sunday is available for $750. The two forecasting event is $1500 and those wishing to include updates and the Global Market Watch for 6 months will be $2,000.